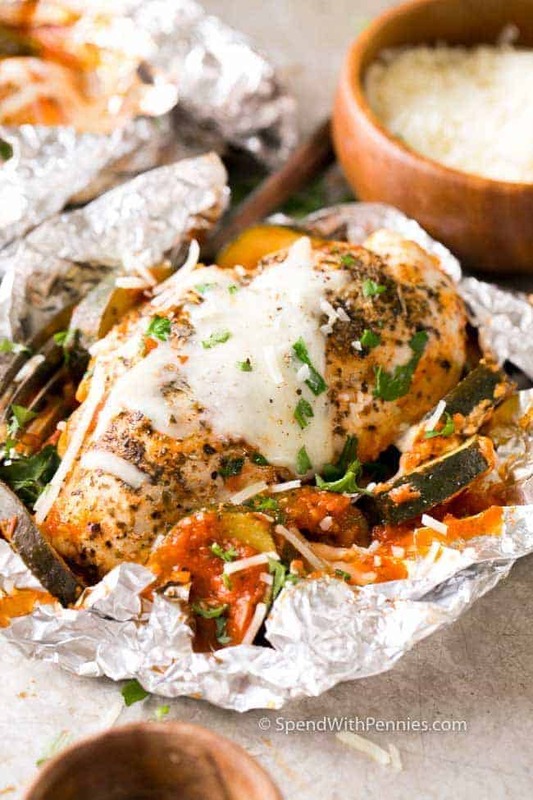 Parmesan Chicken Foil Packets contain a complete dinner in one tidy little packet! 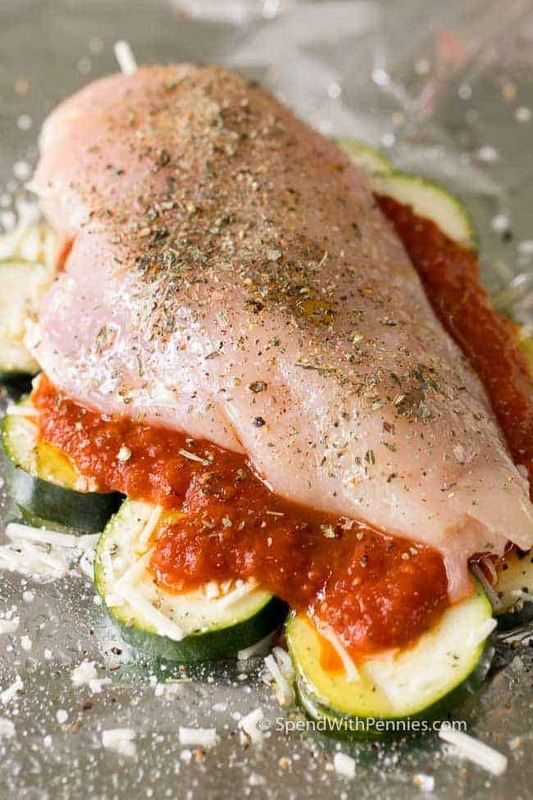 Fresh summer zucchini, zesty tomato sauce and tender chicken breasts are grilled until perfectly cooked and topped with melty mozzarella cheese. This is going to become your favorite summer meal! 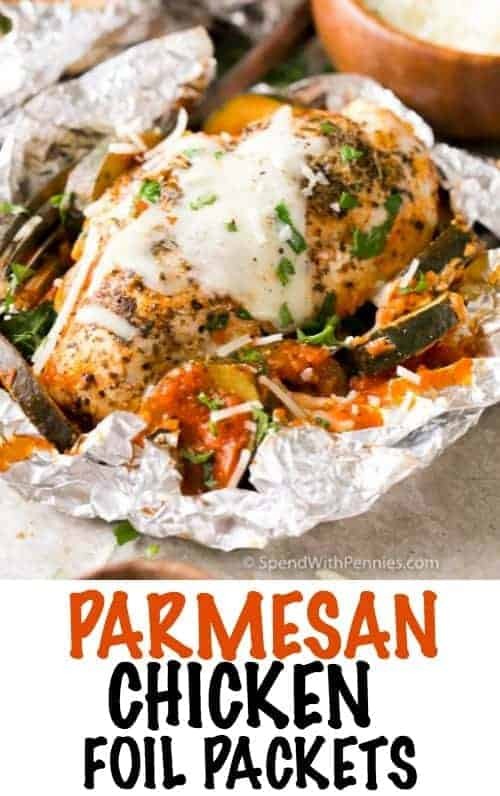 Chicken Parmesan Foil Packets are a super easy summer meal! You are going to love how simple both the preparation and the clean up are… and to top it off they are absolutely delicious! Not only are these quick to make, you can prepare them well in advance and they cook in about 20 minutes! This makes them the perfect meal to whip up on a hot day or even while you’re camping! 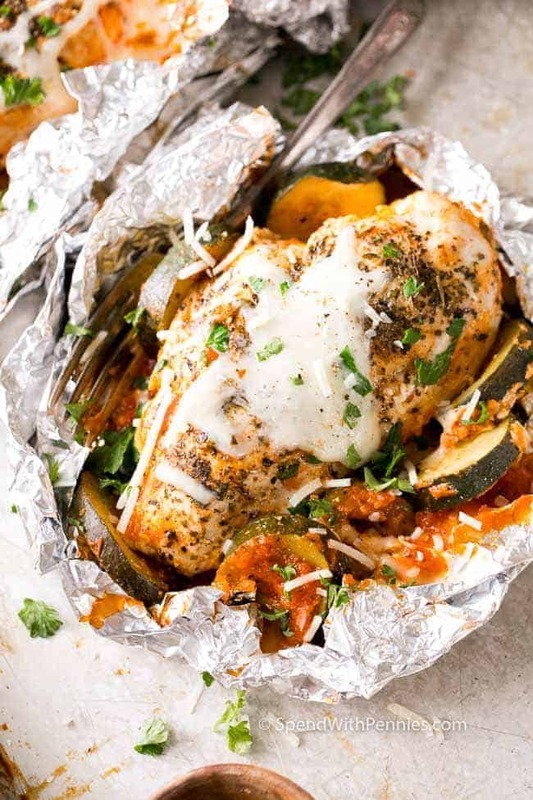 Layers of zucchini (or your favorite grilled veggies), tomato sauce and chicken are seasoned and grilled and finally topped with mozzarella cheese just before serving! Picture this….it has been a long day. The last thing you feel like doing is making a meal! You remember that you have prepared Chicken Parmesan Packets the night before and they are waiting in your refrigerator! Bless! Pop them on the grill or in the oven, prepare your favorite pasta and you have a complete meal ready in minutes! 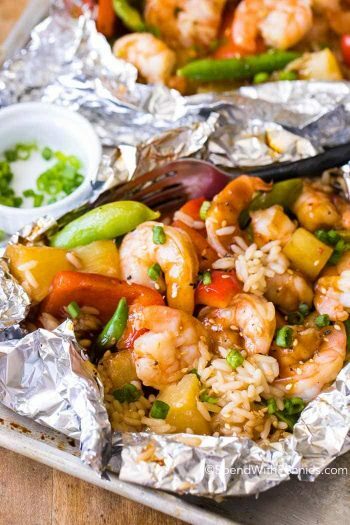 Be sure to spray your foil well (or use non-stick foil) so your food doesn’t stick. Be sure to seal the packets well to avoid any juices escaping. These can be baked 30 minutes at 375 degrees (or until your chicken reaches 165 degrees and is cooked through). 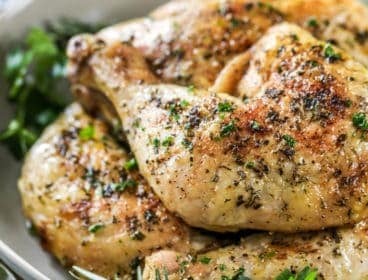 This recipe calls for Italian Seasoning and garlic powder, however use what seasonings you love or have in your pantry. Some ideas are garlic, basil, oregano and parsley. Use fresh herbs if you have them, fresh herbs only make things better! 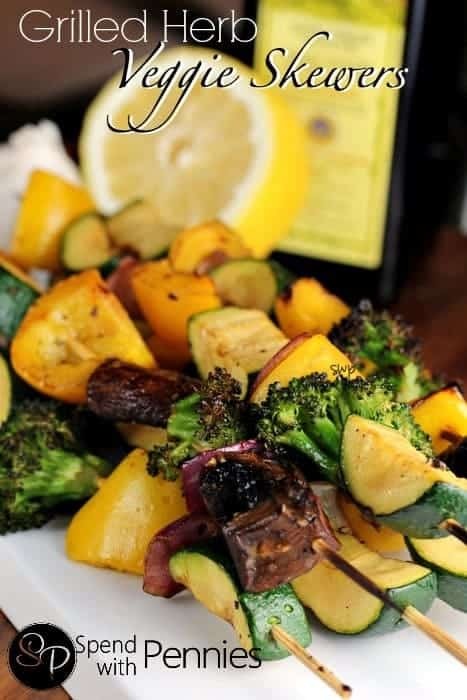 If you do not have zucchini use broccoli, mushrooms, asparagus or summer squash instead! While this would still be great paired with the tomato sauce, you could also use your favorite alfredo sauce. If you choose alfredo sauce, simply cook the chicken, mushrooms, and asparagus in the packet first, and sauce with a heated alfredo sauce once you plate it. You may be asking, “why not add alfredo sauce to the packet?” I fear the creamy sauce may burn in the packet! 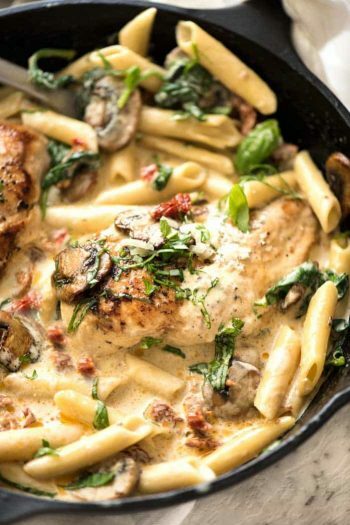 While I most often serve these on a bed of pasta, these chicken foil packet dinners are so good, you really don’t need to serve them on pasta at all! Prep a nice fresh side salad and a thick slice of crusty bread to sop up all of that delicious sauce and you’re good to go! Are you looking for a gluten free option? You can use gluten free pasta or skip the pasta all together! 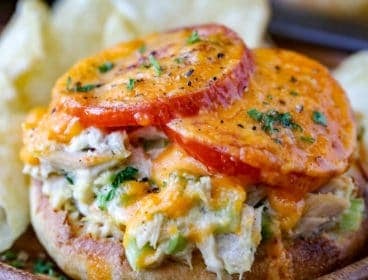 If you’re watching calories and fat, this is still a perfect option, add in some extra veggies and then use low fat mozzarella and parmesan cheese. The taste and texture will still be the same you will virtually never notice the difference. 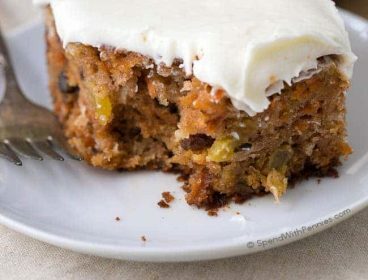 My absolute favorite thing about this recipe is there is no clean up! It is such a breeze to tossing the foil leaving more time to spend with your friends and family or just to take a few extra minutes to yourself! You definitely deserve it! 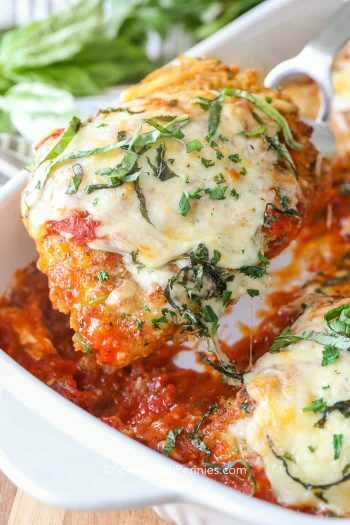 If you are looking for something that is tasty, healthy and quick for your dinner tonight, these Chicken Parmesan Foil Packets fit the bill perfectly! The perfect fuss free BBQ idea or even a delicious gourmet idea to take along on your next camping trip. 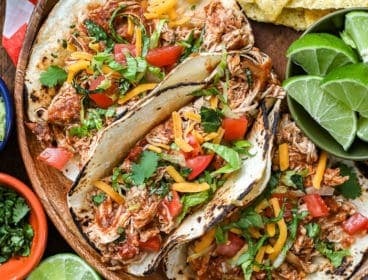 So versatile, super easy and totally delicious it will definitely be top of mind for your summer meal planning. 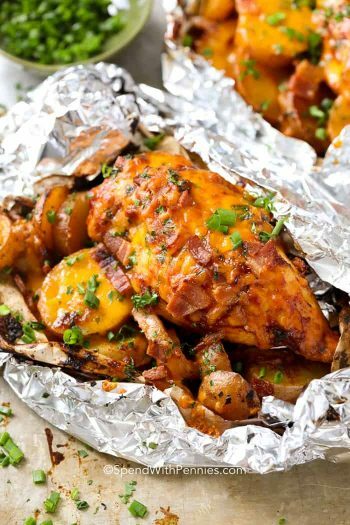 Parmesan Chicken Foil Packets contain a complete dinner in one tidy little packet! 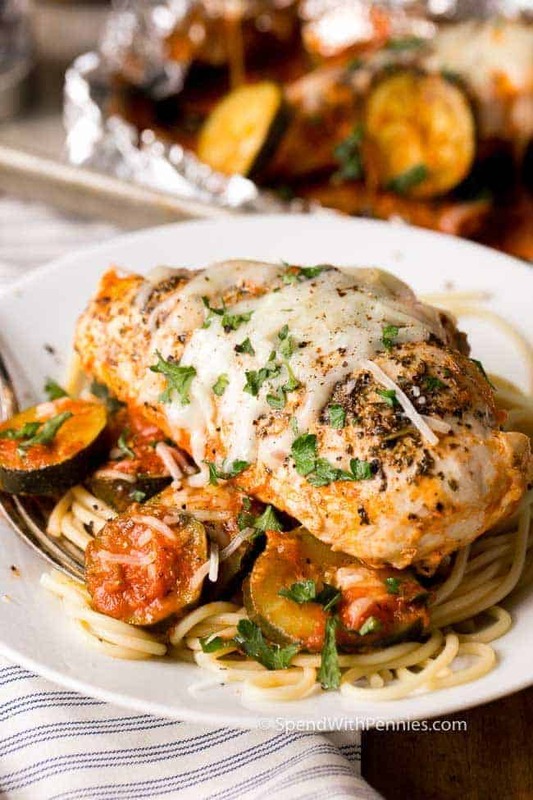 Fresh summer zucchini, zesty tomato sauce and tender chicken breasts are grilled until perfectly cooked and topped with melty mozzarella cheese. This is going to become your favorite summer meal! Preheat grill to medium heat. Spray four 12x18 inch foil pieces with cooking spray. 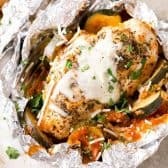 Divide zucchini over the four pieces of foil. Sprinkle with salt, pepper and italian seasoning to taste and 2T parmesan cheese. Add 1/3 cup pasta sauce on top of the zucchini. Place a chicken breast on top of the sauce. Drizzle each chicken breast with olive oil then sprinkle with garlic powder, italian seasoning, salt and pepper. Seal each packet. Place on heated grill with the chicken side down. Grill for 8 minutes. Flip each packet and continue to grill for another 8-10 minutes or until juice run clear and chicken reaches 165 degrees. If desired, cook pasta according to package directions and heat remaining sauce. Remove the chicken and zucchini from each packet and place on top of the pasta. Pour any extra sauce from the packet on top as well. Sprinkle with freshly grated parmesan and garnish with fresh parsley. The best way to heat the mozzarella is to place the four foil packets on a pan and carefully open each packet with a knife (be careful as steam will escape and be hot). Sprinkle with mozzarella. Place the pan back on the warm grill and close the lid for 2-3 minutes or broil if desired. If frozen, cook frozen or thawed and for how long. I work nights and son and daughter in law work days. With a 5 year old and 21 month old twins, these would be great to pull out of the freezer. I haven’t tried freezing this, my worry is that the zucchini wouldn’t freeze well. It tends to get watery when frozen. Instead of sliced zucchini, I plan to try this with zoodles tomorrow. Half the family won’t eat zucchini but if I spiralize it into zoodles, they gobble it up. Also keeps it lo-carb as there is no pasta. Cooking time should remain the same. Hi. We tried this recipie and it turned out awesome. We skipped parmesan cheese altogether and added egg plant slices with zucchini. It has become our family’s favorite. It’s super simple and super yummy. Thank you so much! I am so glad you loved them! A family favorite around here too! Happy to hear you enjoyed it so much Carol! Want to try this, but I’m having a problem with the veggies. I only eat spinach, greens, potatoes, and green beans. So how can I factor those things into the prep without it becoming a disaster? You could try replacing the zucchini with green beans. Let us know how it turns out Nicole! I am a nurse and work 10 to 12 hour shifts Mon thru Thurs. This is a fabulous dish to prepare ahead for my family. I used spaghetti squash cooked el dente, mushrooms and so.e onion. Fantastic. Made this tonight! It was terrible! My zucchini never got soft. I had it in the oven for 40 minutes! It didn’t even look good! I would never make this again . Oven temp 375. I’m sorry this didn’t work out for you, zucchini is a tender vegetable and should definitely have been very soft after 40 minutes. I can’t say for sure what happened to your zucchini. This recipe was amazing!! I’m going to make it again. Question…how can I cook this without the foil packs? Put in a 13×9? The last time I made a bigger mess using the foil packs and wondered if it would turn out the same in a 13×9 covered with foil? I really loved how it turned out in the foil packs, and want the same, just less mess…is that possible? I haven’t tried it that way but I’m sure that would work just fine. Please let us know how it works for you if you do try it! 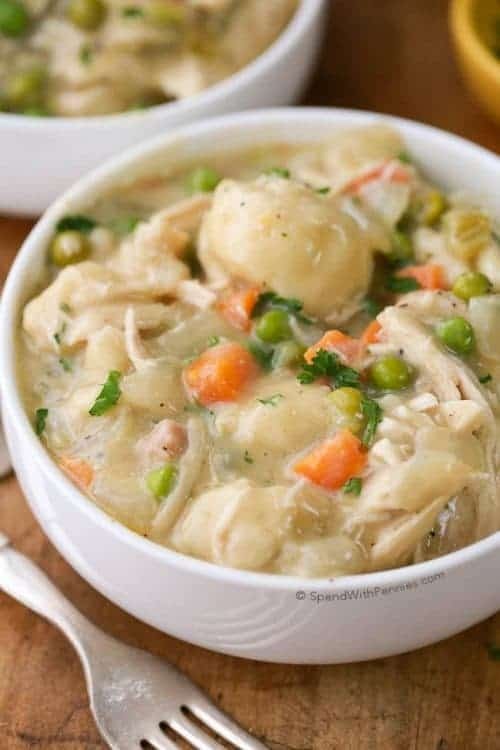 I wonder if you could make this in the crockpot? I dont see why not. Baking chicken always dries out for me. I made this tonight in the oven 375 degrees 40 minutes and additional 5 minutes for the mozzarella . Excellent, did not have pasta since we are eating low carb. Had left overs for the week! So glad you enjoyed it Cheryl! Cheryl, you can check out Holly’s Easy Low Carb website for more low carb recipes! Can you prepare wrap in foil and then freeze for baking later, if so can you bake from frozen and if so how long at 375/400 degrees? We cooked this meal on the grill tonight. It was very easy to prepare and extremely tasty! We will definitely be making this again soon! It was great, even my picky grandson liked it. Should you put the packets directly on the oven rack or use a baking sheet? I use a baking sheet in case any of the liquid leaks out. When you say tomato sauce is it heinz ketchup or do u mean something different??? The tomato sauce is not Ketchup. You’d be looking for a sauce more like these ones here on Amazon. 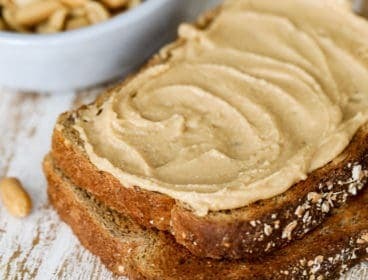 So easy and so delicious!!!!! I made this for dinner tonight. Excellent! Thank you so much for the recipe! I’m so glad you loved them Beverly! This was so easy and delicious. I forgot the oil and it did not matter. Also did not serve with pasta. Happened to have fresh basil which I added. Thanks for a good recipe. holy-Moley! This was a WONDERFUL dinner! The only change I made (due to laziness) was to use “chicken tenders” instead of hammering on the chicken breasts to flatten them. They tasted amazing – cooked in about 40 minutes (total) on the grill set at about 400 degrees. we give it a 5-star rating! 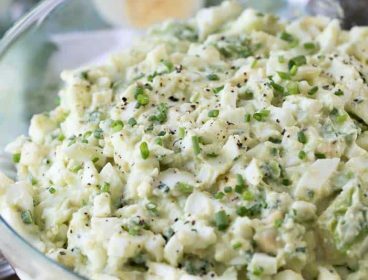 Serve a green salad and some garlic bread….excellent! So glad for your suggestions Beverley! I don’t have a grill but will try them in the oven. Chicken tenders are so handy. I don’t grill, so how long in the oven and at what temp. Do you mean the thin boneless chicken breasts? The regular boneless breasts are quite large and need to be cooked an hour on 400 to cook thoroughly. I use regular boneless chicken breasts. They can certainly vary in size so as long as they’re cooked to 165 degrees, they’ll be perfect! Made this, and loved it! However, I also sautéed some onions and mushrooms… Set them aside, and then put them on the chicken before I added the mozzarella cheese… Oh Sooo Yum! And I only had to cook each foil side for 12 minutes at 400 degrees. Yummy addition, I love mushrooms! Thank you for sharing! How long with thighs on an electric outdoor grill? I haven’t tried this with thighs. You’ll want to cook them long enough to ensure they reach 165 degrees. I just cooked these tonight for dinner. They were delicious! I backed them in the oven at 375 for 35min and then another 5min with the mozzarella cheese on top. The chicken was juicy and tender, zucchini was perfect. Thank you very much for the recipe. Another staple favorite for our family. I am so glad your family liked the recipe, Gigi! It is a staple here too! Don’t have a grill…so oven temp? for how long? 375 for about 35 minutes should do it Linda. Mmm these will be amazing on the grill!! YUM! I love the idea of a delicious and mess-free dinner. Anything cheesy, and l’m in. That chicken looks scrumptious, and so healthy too. I bet even my fussy littlr girl would love that. I always love a recipe that I can prep in advance, especially in the summertime! Plus, no cleanup?? That sounds perfect! LOL! I’m with you, I’m all about less dishes! 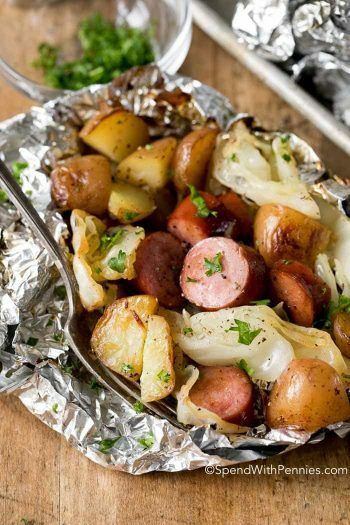 Love the idea of foil packets on the grill. Super versatile too! Yes, any veggie can go into the packets! I’m always looking for new chicken recipes. Plus I love cooking in foil packets. Me too Ellen! So easy to cook! Really fast, easy and delicious. I added a little white wine along with the olive oil. Think I’ll add some eggplant next time. I’ll definitely make this again! Thank you! I’m so glad you loved it! Eggplant would be a delicious addition to this recipe! Yummy and delicious. This is my favorite dish and i just made it. Thanks for sharing such delicious recipe. Back in my day we didn’t have these fancy shmancy vegetables. In my day, if you wanted to have fun there was only one show in town — it was called “Stare at the sun!” … That’s right! You’d sit in the middle of an open field and stare up at the sun till your eyeballs burst into flames! And you thought, “Oh, no! Maybe I shouldn’t’ve stared directly into the burning sun with my eyes wide open.” But it was too late! Your head was on fire and people were roastin’ chickens over it. … And that’s the way it was and we liked it! WOW! I bet that was the best best roasted chicken ever… I wish we still did things like back in the day. Yummy this looks so good and so easy! Thanks for sharing it. This was so easy and delicious! I did a garlic olive oil with all the seasonings and a bed of zucchini, peppers garlic parm cheese and onions. I cooked the chicken at 375 for 35min and then topped with mozzarella and Montrey Jack cheese and broiled for a couple minutes to get that golden brown too. My entire family loved it! 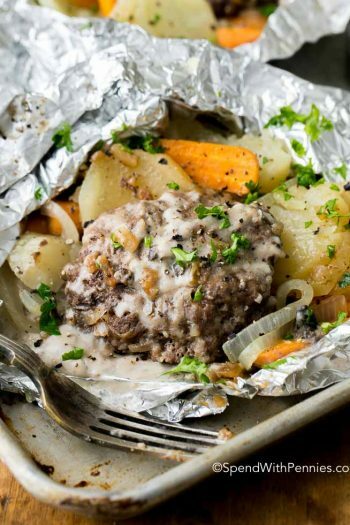 What’s easier than throwing everything in foil and letting it cook? Total idiot proof! I’m so glad your family loved this! I love the addition of peppers & onions, they’d be so good in this dish! Well I obviously did something wrong. We cooked it, and cooked it and cooked it. Finally gave up and ordered pizza as every one was hungry. By the time it got done the zucchini was mush and we threw it out. Waste of money. What sort of problem were you having? 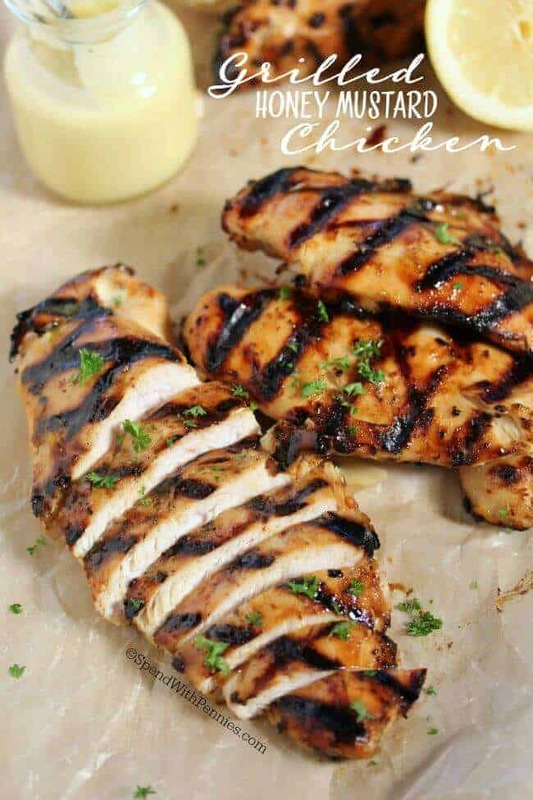 Chicken should cook on the grill within about 20 minutes or less. Was your chicken boneless? Oven. 375 for 30 minutes. Wasn’t done. 400 for 10 minutes more, wasn’t done. 425 for another 12 minutes and finally the chicken was done, but every thing else was just mush. Not sure what went wrong :( Chicken was thawed before hand so it should have been an easy meal. I’m not sure why they didn’t cook through, 55 minutes is a really long time (even at 350 degrees) to cook boneless skinless chicken breasts. If the chicken was wrapped in foil with the shiny side out, that would increase cooking time as heat is then reflected. It shouldn’t affect the cooking time. I made this for dinner tonight – baked in the oven and it was great! I enjoyed all the flavor and very simple to make. Can you use any kind of oil? Yes, you can use any oil. To bake, use a 375 degree oven for 25-30 minutes or until chicken reaches 165 degrees. You will want to ensure that the chicken reaches 165 degrees. If they’re smaller boneless skinless chicken breasts they shouldn’t take much more than 25-30 minutes. With all of the concerns lately about cooking in foil, I’ve started lining it with parchment paper. You can even buy parchment lined aluminum foil now. This looks yummy and on my to try list. Thanks for your wonderful site! Thank you for the great suggestion to use parchment paper. Let me know how it works out! They look perfect and lately I have been grilling anything and everything. Easy cleanup and I don’t have to turn on my oven. Great idea to try! Thank you Averie, this is one of the best foil pack dinners I’ve ever had! Can u cook several and put some in the freezer ? I haven’t tried freezing these but I’m sure it would work.